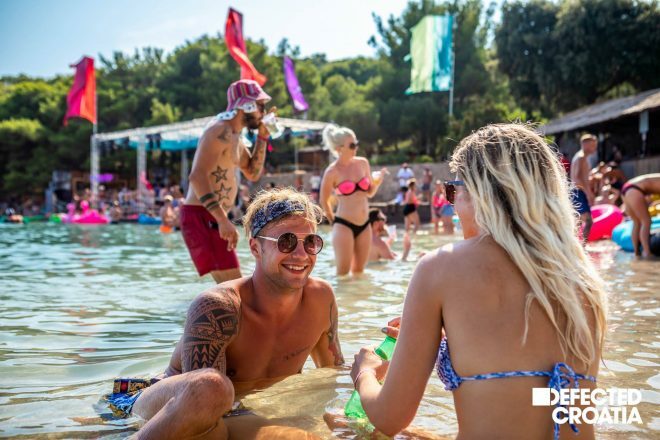 The full programme for Defected Croatia 2019 has been revealed, featuring a new Terrace stage showcasing emerging talent, an extended boat party schedule and the return of the daily Wellbeing sessions. The festival will run for its fourth year from Thursday 8th to Tuesday 13th August 2019 at The Garden Resort, Tisno in Croatia. Building on the success of the previous three years of the festival, tickets for Defected Croatia 2019 have sold faster than ever and are likely to sell out within weeks. The boat parties, which have been increased from 12 to 18 in total across the week due to popular demand, went on sale to ticket holders in early April selling more than 80% of tickets within a week. The programme announcement reveals how the Defected Croatia site’s main stage will be hosted in turn by Glitterbox featuring Armand Van Helden, John Morales and more, Classic vs Eats Everything’s Edible with Honey Dijon and Folamour and of course Defected with the full might of the label’s roster – Roger Sanchez, Masters At Work, MK, Sam Divine, Low Steppa, Ferreck Dawn and many more. The Olive Grove will host a series of specially curated sessions, including Afro House, Garage Sessions with Todd Edwards, live acts and 4 To The Floor house classics. The Beach Stage will run through the day with headline sets from Purple Disco Machine, Nightmares On Wax, Dimitri From Paris, DJ Gregory and many more. After parties taking place at Barbarella’s (DJ Mag’s #29 club in the world for 2019) will feature Spen & Karizma, Riva Starr, Mike Dunn and many more. In total, over 90 world-class DJs and live acts will perform over the six-day festival. This year the festival will have a brand new ‘community’ stage populated throughout each day with only emerging DJ talent, personally selected by Defected’s Managing Director Wez Saunders and the A&R team. Part of an initiative to find and nurture new DJs, in early 2019 an invite was extended to all ticketholders to submit mixes for a competition to earn a coveted spot at the festival. With so many outstanding entries sent in, a whole new DJing space was devised, to host over 30 of the best entrants. Going a few steps further than the previous DJ mix competitions that have run every year since the beginning of the festival, the Terrace will give a well-deserved platform to promising mixers from around the world. The Terrace will have a mellow daytime vibe and is close to The Garden resort’s restaurant, providing a soundtrack for festivalgoer’s more relaxed moments away from the hub of the festival site. Returning after the success of last year’s Wellbeing programme, Defected Croatia’s alternative festival sessions will again run every morning. Led by highly qualified practitioners, the sessions will include meditation with the makers of the Samten app, yoga with Smokin Jo, the Karavan spiritual journey with Pierre Ravan and Shovell celebrating the power of silence. Offering festivalgoers a moment of restoration after days and nights of partying, the Wellbeing programme is becoming a key part of the festival’s identity, balancing the infectious energy of house music with the chance to truly relax, providing attendees with a uniquely well rounded holiday experience on the stunning shores of the Adriatic. Final Release Full Festival Day & Night tickets are available at £229+BF, with day tickets at £49+BF. Group tickets and a deposit scheme are also available, see the Defected Croatia website for all details: defected.com/croatia. There is still a chance to grab on site accommodation. Camping options are available; festivalgoers can contact The Garden Resort to secure their places onsite. This is booked via The Garden Resort website. Alternatively, Tisno is a short walk from the festival with plenty of affordable apartments and hotels. Off site accommodation is booked via Love Music Travel.